HELTER SHELTER Estevez envisions a face-off between the powerful and the poor to raise awareness of this country’s vulnerable invisible. In 1985, which member of The Breakfast Club would you have guessed would go on to become the most accomplished artist? Anthony Michael Hall? Molly Ringwald? Life imitated art a bit when it came to Judd Nelson and Ally Sheedy. They played troubled underachievers in John Hughes' classic. Nelson has mostly toiled in low-budget pictures and TV, while Sheedy has worked sporadically and struggled with substance abuse. Emilio Estevez once looked like the cultural runt of the litter. His father is Martin Sheen. His brother is Charlie Sheen, which doesn't mean today what it once did. In 1987, when Wall Street was released, Charlie was as big as stars get. Estevez, meanwhile, has methodically reinvented himself as a writer-director of ambitious films such as Bobby (2006) and The Way (2010). Currently scheduled to open April 26 at the Savoy Theater, The Public is his most assured and trenchant to date. 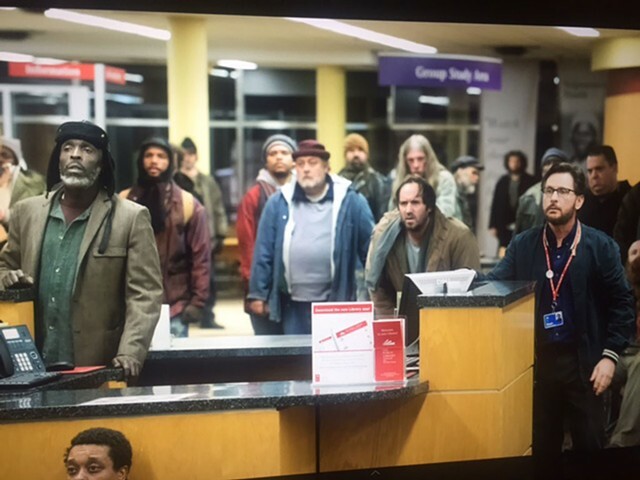 Estevez wrote, directed, produced and stars in the ripped-from-the-headlines story of a public library occupied by members of the public who have nowhere else to go. The headline he ripped it from is "Written Off," a 2007 Los Angeles Times piece by librarian Chip Ward, examining the forces that have transformed America's libraries into de facto homeless shelters. Estevez plays Stuart Goodson, supervisor of the Public Library of Cincinnati and Hamilton County, where the film was shot. Ever more of his time is spent supervising indigent people who take shelter there each day. A former addict who himself lived on the streets for a time, Stuart has an easy, respectful rapport with the population. Unfortunately, he also has a boss (Jeffrey Wright) who's about to fire him because of a lawsuit and a slimeball nemesis, the city prosecutor (Christian Slater), who's running for mayor and is happy to pretzel the truth, invent facts and stoke the public's discomfort with the homeless to net votes. That's right, he's the film's official Donal Trump proxy. At one point, Slater's character lies to a TV reporter about a situation, and someone cracks, "fake news." That situation is a nonviolent protest by 70 desperate men. The city's shelters are full, and it's so cold that people outdoors are freezing to death at night. So these guys decide to sit tight, and Stuart backs them up. He even springs for pizza. It sounds harmless enough, right? But Estevez does something unexpected. Slater's slimeball lies to the media, claiming Stuart is armed and holding hostages. Faster than you can say Dog Day Afternoon, a police negotiator (Alec Baldwin) is on the line, and SWAT teams are suiting up. Suddenly, the librarian is looking at the possibility of not making it to morning. Things get white-knuckle in the course of the standoff. The scenario has a delectable sense of '70s paranoia: Think Ex Libris: The New York Public Library meets One Flew Over the Cuckoo's Nest. Estevez manages more than making pulses pound; he makes salient points concerning income inequality, addiction, mental illness, climate change, police brutality and the ailing state of literacy. That's a lot for one movie to shoulder, but he makes it look effortless. More importantly, he makes it credible, human and illuminating. T.S. Eliot wrote that we should "arrive where we started / And know the place for the first time." The Breakfast Club was set in a library. Thirty-four years later, Estevez once again stalks the stacks. It's a digital world, sure, but this love letter to lending institutions still merits checking out. As a filmmaker, Estevez has arrived. The original print version of this article was headlined "The Public"